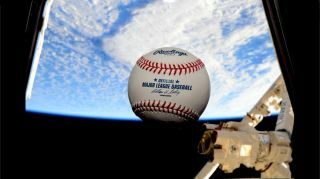 NASA astronaut Terry Virts snapped this photo of an MLB baseball floating in weightlessness on the International Space Station for opening day on April 6, 2015. An astronaut aboard the International Space Station has made a game of photographing every Major League Baseball stadium from orbit — and he wants you to play along. NASA astronaut and baseball fan Terry Virts is taking pictures of the 28 North American cities that host a major-league team, then posting the photos to his Twitter and Instagram accounts (@AstroTerry and astro_terry, respectively), along with the hashtag #ISSPlayBall. But Virts isn't identifying the cities as the photos go up. That's where the game comes in: He wants you to guess what they are. The goal is to help give people a new perspective on their surroundings and inspire them to learn more about the International Space Station, NASA officials said. NASA astronaut Terry Virts posted this photo on Twitter on Feb. 23, 2015. He wrote: "The first #NameThe city of this @MLB season! Do you know your city as well as your team? #ISSPlayBall it is #GameTime"
"This is my favorite thing to do in orbit," Virts said in a statement. "I like to try to think of creative ways to take pictures, from a new perspective, or with new lighting. There is always something interesting looking out the window — if it's lightning, aurora, city lights at night, interesting geology on Earth, wide angle 'big picture' scenes of the Earth as a planet, the moon, planets or even stars — there is never a lack of good subject matter." Virts is a fan of the Baltimore Orioles, his hometown team, and played baseball as a kid all the way through high school, NASA officials said. Virts began his stint aboard the space station in November 2014, as a crewmember of the orbiting lab's Expedition 42. (The current mission is Expedition 43.) Jackie Robinson, who became Major League Baseball's first black player in 1947, wore number 42, and a replica Robinson jersey is currently zipping around Earth aboard the space station, NASA officials said. The 1947 baseball season started on April 15, so that date has been commemorated as Jackie Robinson Day. Virts may don the Robinson jersey on orbit this coming April 15, NASA officials said. There are currently 30 Major League Baseball teams. Two cities — Chicago and New York — host two teams apiece. All of these teams are based in the United States except the Toronto Blue Jays.